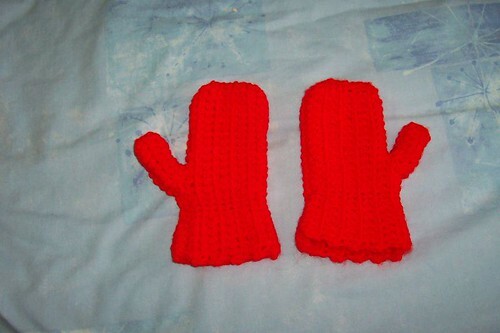 Nasty Mittens « T-Bird\’s crafty Blog! Now, I’m sorry if I’m rubbishing someone’s prize pattern here but these did not float my boat at all. By the time you have made the thumb they are just too wide at the wrist and yes, i did follow the pattern (at first anyway!) Anyway, a bit of massaging to the pattern and I got something passable if not perfect for keeping small hands warm on chilly nights. This entry was written by tbird and posted on 4 November , 2006 at 4:28 pm and filed under Uncategorized. Bookmark the permalink. Follow any comments here with the RSS feed for this post. Post a comment or leave a trackback: Trackback URL. Could you crochet a cord and thread it through the wrist to tie up? (I was watching my mum crochet a waist drawstring for a pair of woolly longies this week!) Not sure how comfy it would be, having them tied on, but has to be more comfortable than them falling off?